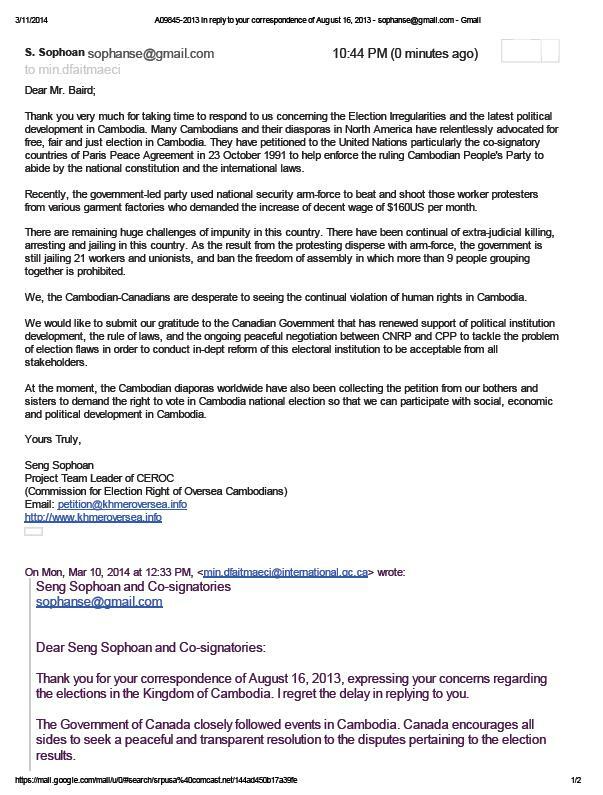 Thank you very much for taking time to respond to us concerning the Election Irregularities and the latest political development in Cambodia. Many Cambodians and their diasporas in North America have relentlessly advocated for free, fair and just election in Cambodia. They have petitioned to the United Nations particularly the co-signatory countries of Paris Peace Agreement in 23 October 1991 to help enforce the ruling Cambodian People’s Party to abide by the national constitution and the international laws. Recently, the government-led party used national security arm-force to beat and shoot those worker protesters from various garment factories who demanded the increase of decent wage of $160US per month. There are remaining huge challenges of impunity in this country. There have been continual of extra-judicial killing, arresting and jailing in this country. As the result from the protesting disperse with arm-force, the government is still jailing 21 workers and unionists, and ban the freedom of assembly in which more than 9 people grouping together is prohibited. We, the Cambodian-Canadians are desperate to seeing the continual violation of human rights in Cambodia. 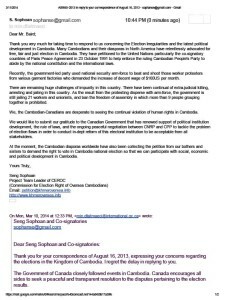 We would like to submit our gratitude to the Canadian Government that has renewed support of political institution development, the rule of laws, and the ongoing peaceful negotiation between CNRP and CPP to tackle the problem of election flaws in order to conduct in-dept reform of this electoral institution to be acceptable from all stakeholders. At the moment, the Cambodian diaporas worldwide have also been collecting the petition from our bothers and sisters to demand the right to vote in Cambodia national election so that we can participate with social, economic and political development in Cambodia. Hun Sen needs to go. He is dictator, violates Human Right, and a traitor.